There are 6 steps in this procedure. If you're having trouble at any stage please contact us at support@skyformation.com. Generating a bearer token to be used in for SkyFormation app centrify connector configuration. From the lefthand side, select Core Services -> Users then click on Add User. Put a name into the Login Name field. Enter values into the Email Address and Display Name fields. Confidential clients do not use these values, but they are required in order to satisfy the required fields of the user form. Enter a Password (Manually or generated) aligned with the password policy requirements. Note: you must remember the password created for the next steps, so use "manual"
password generation and take a note of the password. 4. Navigate to the Status section at the bottom and enable Is OAuth confidential client. In the Description tab, put "Service Account" as the name. In the next dialog search for the user created in step 2 and add it. Select Read Only System Administration and click Add. Click Save to create the new role. On the lefthand side, navigate to Apps -> Web Apps and click on Add Web Apps. In the next Dialog, elect the Custom tab on the Add Web Apps popup. Locate OAuth2 Client in the list and click Add. 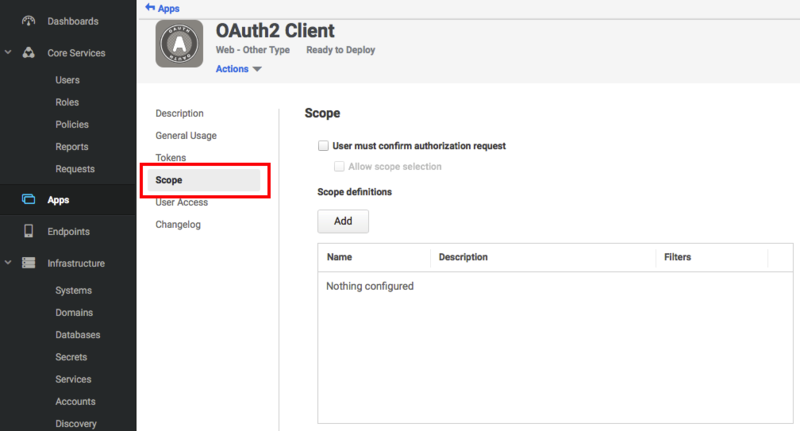 This creates an OAuth2 Client for use with the Centrify APIs. Click Yes on the Add Web App popup that appears. Click Close on the Add Web Apps popup. The app configuration screen is displayed. In the app configuration screen (left side), select categories (listed below). For each category, enter the appropriate data in the fields - see below. step 2. Note that this value cannot contain spaces. () Application Name: a descriptive name for the application. () Issuer: the URL of the server issuing access tokens. Can be left as default. () Token Type: Select JwtRS256. () Auth Methods: Select Client Creds. Note: the user must be in a role that gives them access to the Redrock/Query api. - Allowed REST APIs - click on "add" and Type "Redrock/Query/*". Click on Add to add the user that was created during step 2. And the Client Secret which is the password that the user was created with. After you click on Get Token, a bearer token will show. Copy the token - it will be used next to configure the SkyFormation for Centrify Connector.